The image is from the adrenal gland. Technique: 8 µm paraffin section stained with haematoxylin-eosin. This endocrine gland is located on top of each kidney. That is why it is also called suprarenal gland. It is divided in several compartments where the adrenal cells release a variety of secretory products. There are two main compartments: cortex and medulla. Cortex is subdivided in another three regions. The outer one, known as glomerular zone, contains glandular cells arranged as disordered tubules. These adrenal cells release mineralocorticoids such as aldosterone. The fascicular zone is located just below the glomerular zone, and it is the widest adrenal compartment. 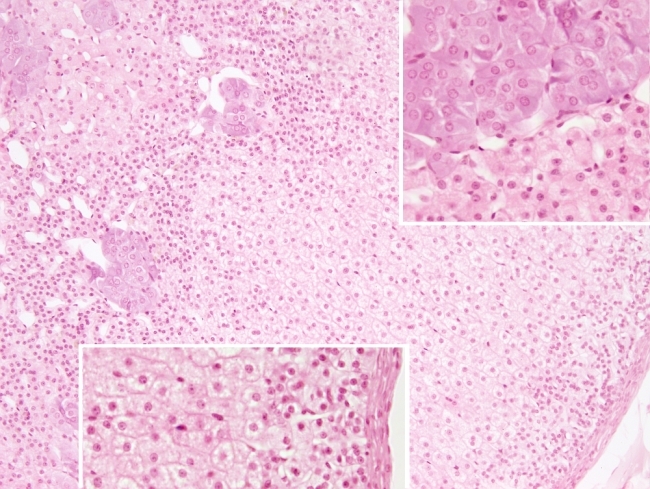 In this zone, the adrenal cells form radially organized tubules and they look like more spongy due to the large amount of lipid drops found in their cytoplasm. Cells from the fascicular zone release glucocorticoids such as cortisol. The third compartment is the reticular zone, which is the innermost compartment of the cortex. In this region, the adrenal cells form non ordered tubules resembling a reticular structure. They release steroid sexual hormones such as androgens. Medullary zone is the innermost part of the gland. It contains large and rounded epithelial cells that are grouped around the medullary blood vessels. Catecholamines such as adrenaline and noradrenaline are released by the epithelial cells into these vessels. 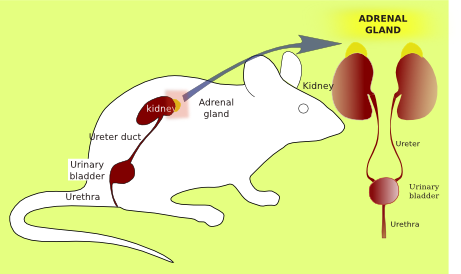 The outer surface of the adrenal gland is covered by a layer of connective tissue. This layer is known as capsule.